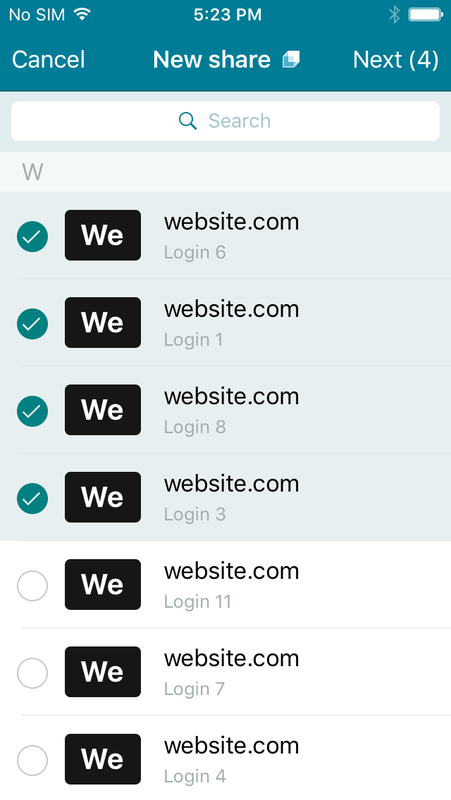 You can use Dashlane's Secure Sharing feature to securely share passwords and secure notes with other Dashlane users. Do I need to be Premium to share? 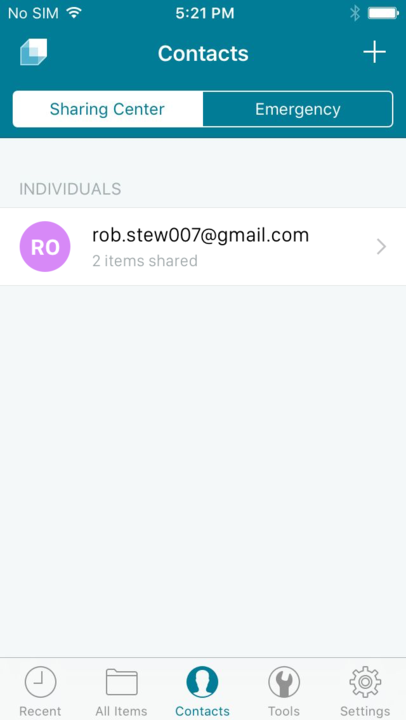 Sharing data in emails or texts is not secure but using Dashlane's Sharing Center is. Sharing this information through instant messaging apps also is insecure, as the information is usually not encrypted and is sent in plain text on the network. This means your information can be read by the company running the messaging service and conversations are also generally saved in the history by these applications. However, by using Dashlane's Sharing feature, your data is encrypted using the best encryption system to-date before even being sent over the internet. Please see the Security and Privacy section of this article for more details. For more information on security and encryption, please click here. 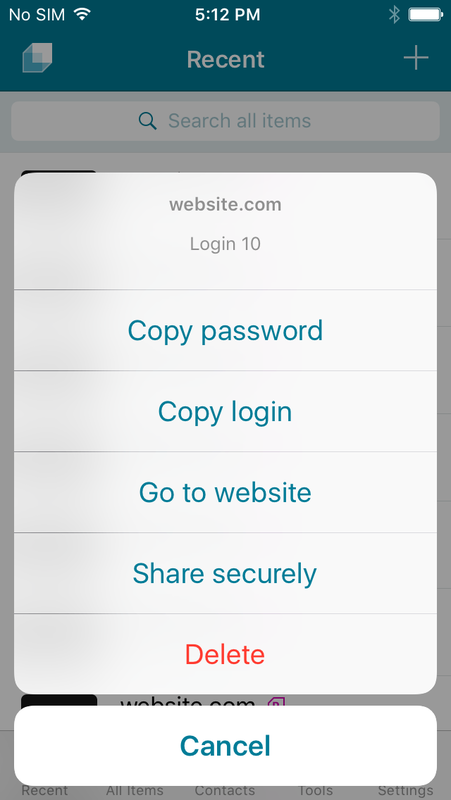 To share an item with someone, simply locate the item from either the Passwords or Secure Notes sections of your Dashlane app, tap on the three dot icon, and tap on Share securely. Alternatively, you can tap on the item to reveal the full details and tap on Share password at the bottom. Next, enter the Dashlane email address of the person you are sharing with, pick the permissions, and tap on Send. Please note that you can choose between two permission settings: Full rights and Limited Rights. Full Rights: The recipient can see, use, edit, and share the password. Note that the recipient can also edit sharing rights, so revoke the sharing rights of other users who were shared this item, including you. Limited Rights: The recipient can use this password, but cannot securely share it nor edit its sharing rights. The recipient cannot modify the password directly within Dashlane, though the password will be updated if Dashlane detects it being changed outside of Dashlane. Within Dashlane, the password is presented as a series of dots, but keep in mind that this hides the password only from a casual or accidental observer. If determined to do so, a technically savvy recipient is able to reveal the password. Once you've shared an item, the recipient will receive an email from Dashlane and receive an alert in the Sharing Center to accept access to this item. You can share Passwords and Secure Notes directly from the Sharing Center. To open the Sharing Center tap on Contacts. From there you can tap on the contacts to whom you have already shared with or shared with you or tap on the + symbol at the top to create a new share. Next, tap on the data you wish to share and tap Next at the top right corner of the window. Finally, enter the Dashlane email address of the person you are sharing with, pick the permissions, and tap on Send. Please note that you can choose between two permission settings: Full rights and Limited Rights. 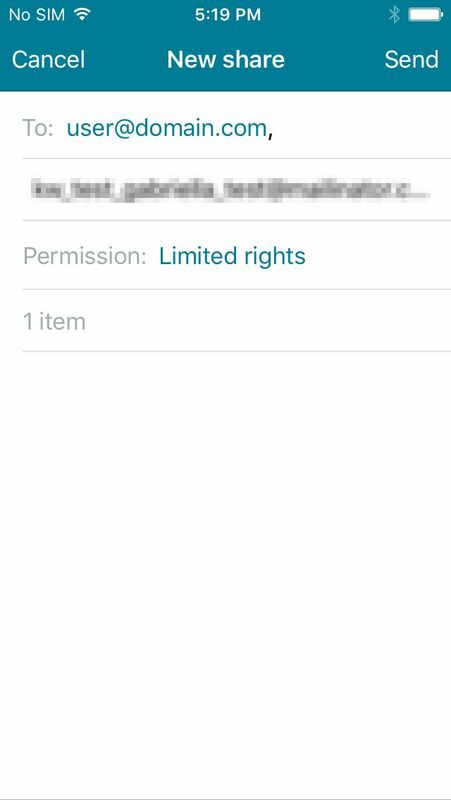 A unique public key saved on Dashlane's servers. When records are shared, the recipient's public key is used for encryption (asymmetric). A unique private key which is directly saved in your Dashlane account and encrypted in your Dashlane settings. This is known exclusively by you and never shared or transmitted to others. This key works even for free users who don't have the sync feature because your account settings are synced across all devices even if you don't have Premium. This private key is used to decrypt data exclusively. Please note that your private key is different to your Master Password. Your private key is encrypted with your Master Password and stored in the settings of your Dashlane account (along with all of your other saved sensitive data). This private key is synced over to other devices in the same way as your encrypted data is. We never send your Master Password over the internet. Both keys are generated together and are meant to work together because they only work in one direction. One can never be used to replace the other. Even with access to your public key, one would still need access to the private key in order for decryption to take place. Shared data is encrypted with the recipient's public key, but can't be decrypted with the public key. What happens if my phone is lost or stolen with all my Dashlane data?